I had the most amazing time with all of the ladies who came to the #80sLadiesDanceParty in September. It was an unforgettable night of fun and positive energy was through the ROOF! As a Party and Event Blogger, there are dozens of themes I’ve been DYING to use for an event. Well, today another one of my DREAMS IS COMING TRUE as I’m hosting a party inspired by one of my favorite chick-flicks of all time, “How to Lose a Guy in Ten Days”. If you haven’t seen it yet, it’s actually on Netflix right now (talk about perfect timing), so make sure to watch it before the party! 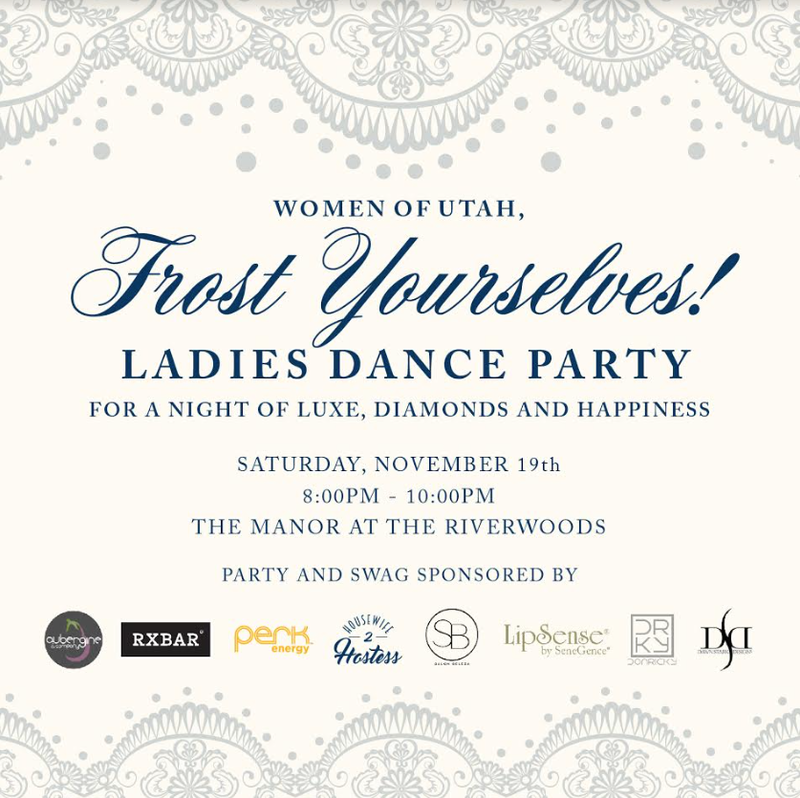 This “Frost Yourself” Ladies Dance Party, inspired by the movie “How to Lose a Guy in Ten Days”, is for women (18+) looking to DANCE their sequins off and enjoy a night of Lux, Diamonds and HAPPINESS! This event will be held on Saturday, November 19th from 8-10PM at The Manor at the Riverwoods (across from Tucanos) in Provo, Utah. • The First 100 guests in line will receive a FREE lip gloss from Lipsense! • Lots of Surprises and Goodies. • One ENTIRE Evening of Lux, Diamonds and Happiness to Dance your sequins off with your Favorite Ladies. So who’s ready for another guilt-free girls night out out? I’m talking about LOTS of pampering, diamonds, luxe, dancing and healthy treats! With the holidays right around the corner, get your favorite ladies together to party on and dance it out! I cant wait to dance with you, blow your mind, dazzle and spoil you with a night away from work, laundry, kids, and other obligations! So grab your best girls for an unforgettable night of pampering, dancing, healthy treats and feeling like the one in a million woman you are! Are there any tickets still available for this event? Where would I find them?